“Composing for Improvisors” marks the next concert in the WSU School of Music’s Faculty Artist Series, 8 p.m. Thursday, Jan. 24, in Kimbrough Concert Hall on the WSU Pullman campus. 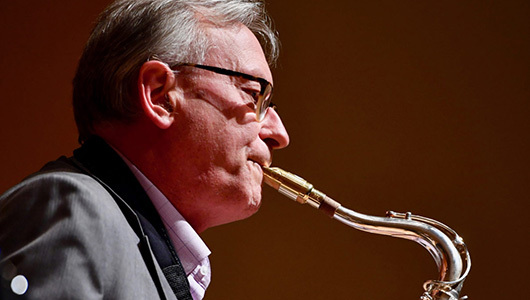 The concert will feature Regents Professor Greg Yasinitsky, an internationally noted composer and saxophonist and winner of the American Prize for Musical Composition. Yasinitsky also will appear with Crosscurrent, a quintet made up of faculty members from WSU and the University of Idaho including Ward, piano; Vern Sielert, trumpet; F. David Snider, bass; and Dan Bukvich, drums. Crossucrrent will perform Yasinitky compositions “Snagglepuss,” “Suddenly You” and “Black Ice.” Closing the concert will be the YAZZ Band, fun‑sized edition — a small big band. YAZZ Band will perform new orchestrations that Yasinitsky wrote especially for this concert, title “Blues for a King,” “Synergetic” and “G.P.” Soloists will include saxophonist Brandt Fisher, a WSU music major and award winner at the Lionel Hampton Jazz Festival; trumpeter Sielert; pianist Ward; bassist Snider; and drummer Jarvis.